Homepage. This page: An unused old garage desk blotter, advertising Mobiloil automobile lubricants. Collecting car-related memorabilia, or 'automobilia', needn't be an expensive pastime (although it often can end up being once you've started...!). Many of the unusual things featured in this motoring collectables section only cost a few £ to buy, the old desk blotter on this page being a classic example. It advertises Mobiloil, one of many oil brands that were available in the 1950s, and is still going strong today. Garages up and down the land would have been given freebies like this by roaming salesmen, keen to sign up new buyers for their range of motorcar oils. 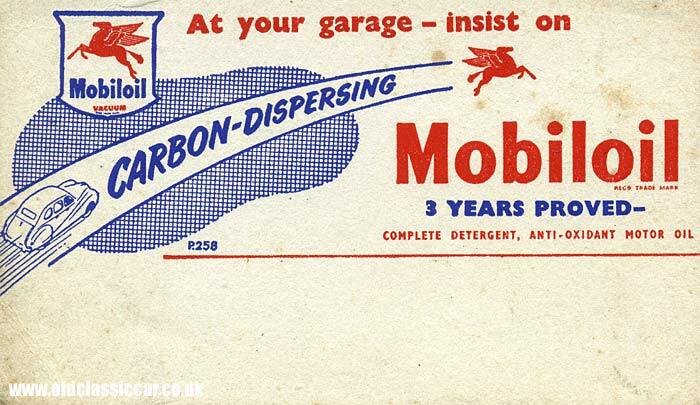 The advertising on this blotter makes a big claim for the 'carbon dispersing' qualities of Mobiloil, and its 'complete detergent, anti-oxidant motor oil' qualities. Unused blotters are quite hard to find, as they'd be used by the garage when writing out, by hand of course, invoices to their customers. This one cost all of £1.50 a few years ago. Return to the motoring memorabilia section to read about more car-related collectables from both the pre-war vintage, and post-war classic eras. A number of other car-related blotters feature, including this one issued by Dunlop Tyres, and another pair relating to Wakefield Castrol oils. An interesting old road map, advertising both Mobiloil and the Norsk Vacuum Oil Company, can be found in the road maps section of this site. A booklet from the 1920s, promoting the use of Mobil oils in the Ford Model T, can be found on the Gargoyle Mobiloil page.